When we think of green building, we tend to picture new construction. But Robert A. Young argues that the greenest building is often the one that has already been built. In Stewardship of the Built Environment, he shows how rehabilitating and reusing existing structures holds untapped potential for achieving sustainable communities. Students and professionals alike will discover the multifaceted benefits of reuse. Young begins by describing how historic preservation in the United States, often overlooked because of the predominant focus on new construction, is actually an important sustainable design strategy. He then examines the social, environmental, and economic benefits of preservation—from the societal value of reusing existing buildings to financial incentives available for rehabilitation. Young concludes with insights into the future of reusing buildings as a sustainability strategy. He also provides several informative appendices, including a glossary of key terms and acronyms and recommendations for further reading. Readers will become familiar with essential terminology; sustainability and historic preservation metrics; government oversight processes; and opportunities for smart growth afforded by rehabilitation. This knowledge is key to preserving the past while building a sustainable future. "For twenty years advocates for so-called 'green buildings' have focused almost exclusively on new construction, ignoring the environmental contributions of the existing building stock. Worse yet, historic buildings were dismissed as energy hogs that should be razed and replaced with green gizmo structures. They were wrong. And Robert Young amply refutes their foolishness in his excellent new book." "It will be very difficult for anyone to leave historic preservation out of an overall sustainability strategy after reading this book. Stewardship of the Built Environment does a great deal to explain the interconnectedness between old buildings, sustainability, energy use and economics, and underscores the critical role old buildings play in a healthy built environment." "This book makes an important contribution to the literature about the intersection of historic preservation and sustainability. 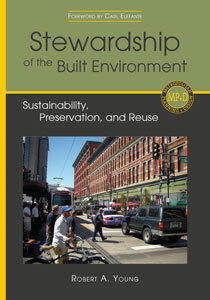 The stewardship of the built environment is simultaneously an act of preservation and sustainability. Stewardship is the core. Young explores both the warp and woof of the rich tapestry of sustainable stewardship, illustrating both its vertical and horizontal relationships." "In Stewardship of the Build Environment: Sustainability, Preservation, and Reuse, author Robert A. Youn takes a philosophical look at the role of historic preservation in the ongoing push toward more sustainable buildings and communities. Supported by countless case studies of buildings that got it right, Young's in-depth analysis of the many factors that go into making a building sustainable (everything from location to energy usage) is a must-read for anyone interested in preservation's role in the green movement." "The underlying call for a paradigm of 'stewardship of the build environment' has broad relevance." "It is difficult to imagine that a planner could work effectively in neighborhood redevelopment or real estate as well without the comprehensive knowledge Young presents in the book."